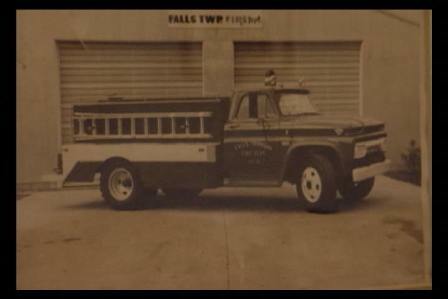 History - Falls Twp. Fire Dept. The Falls Twp. Fire Dept. INC. was established in 1963. Before that the township was protected by the Zanesville Fire Dept., the National Trails Fire Dept., and the Frazeysburg Fire Dept. 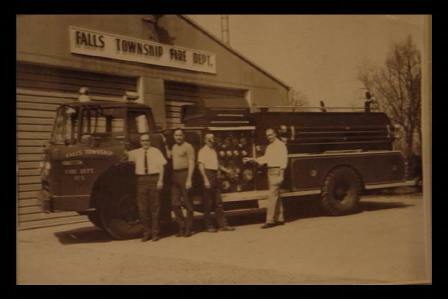 The first fire station was built next to the township hall of Dillon Falls Rd, which is still the current station 301. The pole barn construction was a 2 bay building housing a fire engine and tanker truck. The first fire engine was a 1962 John Bean on a Ford chassis and was numbered Engine #1. That truck was in service until 1999 when it was replace by Engine 311. The tanker was numbered Tanker #2 which was built from an old fuel truck. As the township grew the station had to be added on to, in the early 1970s two more bays were added to the back of the original 2 bay building and in 1972 Engine # 5 was purchased. In 1981 the Muskingum County Commissioners had the need to start an EMS program in the county so they depended on the county fire departments to provide that service. The county purchased ambulances for Falls Twp, Dresden, Harrison Twp., and Washington Twp. fire departments, so once again we had the need to build on. A lean to was constructed on the side of the original 2 bay building and as long in length as the orignial and first addition to house the ambulance, which today is the bay for the grass fire truck, office, radio room, and training room. In the mid 1980s there was a need in the the township to build a station 2 in the Northeastern part of the township. Station 2 is located at 525 Richey Rd. For information on both stations and the apparatus that is housed at them check out the About Us section of our website.